Mordian 7th Regiment: Heresy Era Imperial Fists - Veteran Squad and Contemptor built! Heresy Era Imperial Fists - Veteran Squad and Contemptor built! As a bit of a reward to myself for all the painting of late I thought I'd build the next unit or two for the Imperial Fists. I'm kicking myself for getting so over-excited building all the new Genestealer Cult models that I ended up with a huge pile of unpainted miniatures which tends to be disheartening. So for the Fists I'm sticking to a "build 10 or so models, then paint them before the next group" mentality. We'll see how long that lasts. Hah! The next ten infantry for the Fists are the first of two veteran squads. To take advantage of their legion rules the squad gets a pair of heavy bolters, the Vexilla gives them a little staying power and the Nuncio Vox will allow them to act as spotters for artillery and teleport beacons for their deep-striking terminators. While the vets are technically able to all take combi-weapons and all sorts of other gear to make a 'jack of all trades' unit, I've found it's really easy to end up with a thoroughly over-costed squad which can quite easily be wiped from the table in a single turn. Better to keep them cheap and focused on a single job (which is primarily infantry-killing). 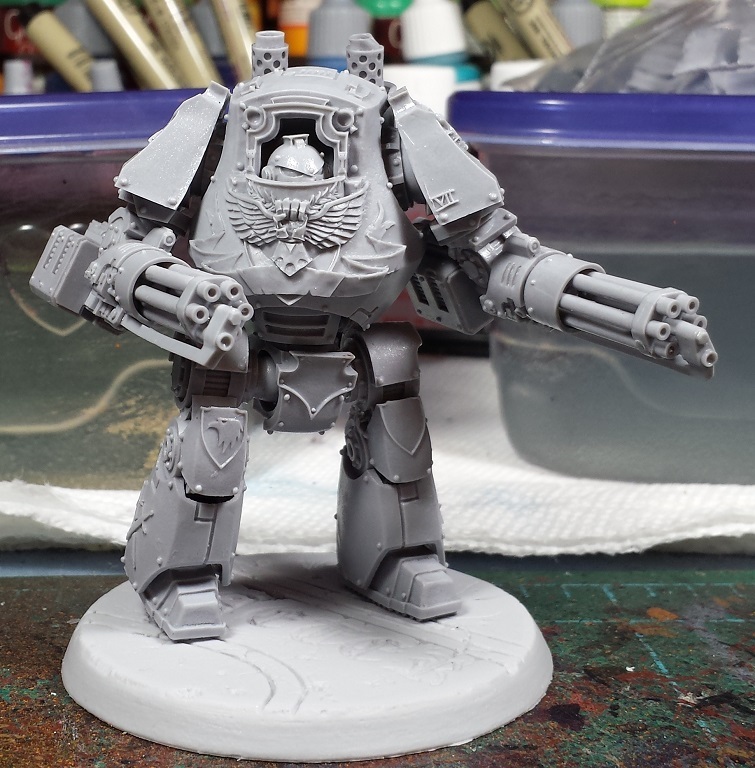 For a little more dakka, the ever-popular Contemptor Mortis with a pair of Kheres assault cannons is hard to pass up. Doubling as a reasonably effective anti-aircraft and anti-infantry unit, I have found this loadout routinely performs admirably on the table top and almost always earns its points. 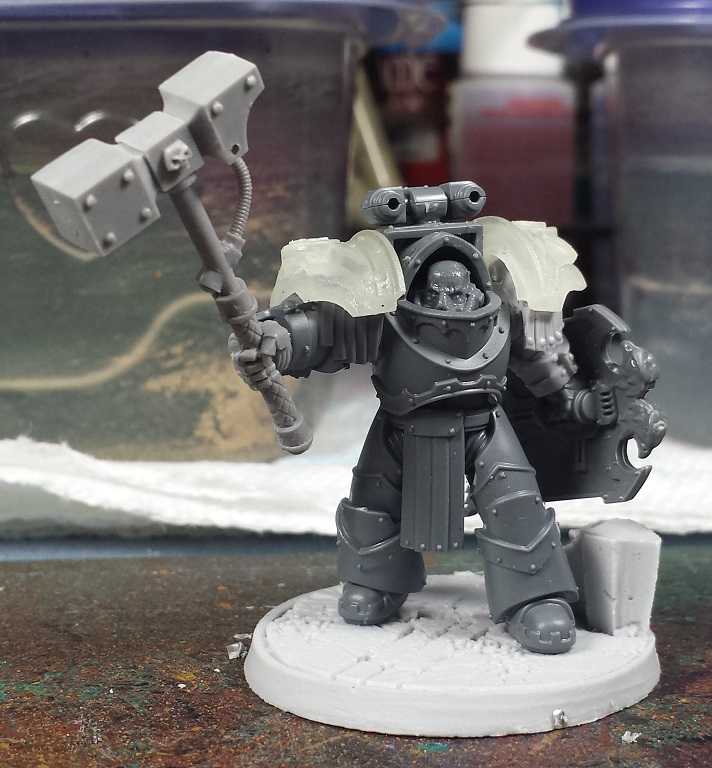 Lastly, I scraped together a few leftover bits I had and put together the proof of concept thunder-hammer-and-storm-shield terminator in Cataphractii armour, using some rather neat 3d-printed shoulder pads, the storm shields from the Custodes set, and some thunder hammers from Spellcrow. The perspective is a little forced on this pic, the hammer isn't really THAT big... Heh. So far so good! Now, if only it wasn't forecast to reach a high temperature of 1°F on Saturday I could get them primered. Apparently these models will be sitting on the "prime me" shelf for the foreseeable future! Ouch on the 1°F! Makes it hard to do anything outside with that. Nice pose on the dread and I like the conversions on the Capitan. Did you 3d print the pads or find a shop doing them? Looking great mate. I agree, winter is a pain for undercoating! Who wouldn't want a hammer that big ? @Joe B: Indeed - I'm all for cold weather but dang! The shoulder pads are from a seller on Shapeways called "Pop Goes The Monkey", they have a ton of cool add-on parts! @Col. Hertford: Aye, Luckily weather in CO is schizophrenic enough that we'll likely have a 55°F day shortly thereafter! @Siph_Horridus: Thanks! I'm definitely digging the MkIII plastics, was worried that they wouldn't have the detail that FW's resin versions would but I gotta say the GW folks knocked 'em out of the park! @Francesc: Indeed, they'll likely get some transport and do the outflank thing to keep them alive for a bit longer! Love that termie at the end with his big hammer call out like "You traitor, you are next." Are you going to go for the same scheme as previously? @30k plus 40k: Thanks man! Aye, they'll be predominantly yellow, with a few black accent plates here and there. The Cataphractii terminators will be mostly black with yellow accent panels in contrast. But my captain is almost exactly the same way! Did you sneak in and look at him? I love the look of Mk3 Marines. 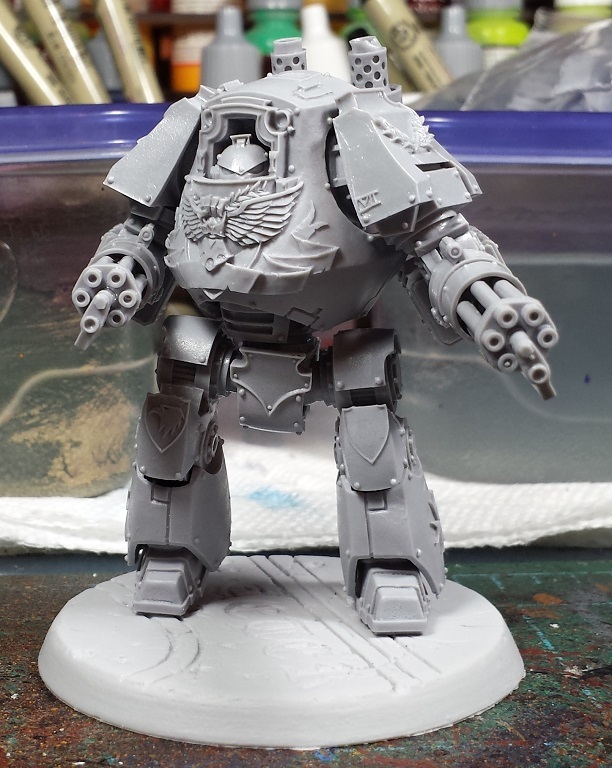 I wish FW would get around to releasing the UM Contemptor - they keep telling me its in te production queue whenever I ask. @Frothing Muppet: Indeed, I'm well pleased with the Mk.III plastics! Can't wait to see the UM Contemptor see the light of day as well! These look cool so far. Interested to see what the details are on those printed shoulder pads.